A few friends are super excited to welcome their new additions and have requested I share my list. Six months in with A and I can absolutely tell you what we’ve used and what we haven’t. So without further ado, the must have list is below followed by my specific recommendations. car seat – find one that will fit in your car and not make your front passenger have no leg room. I have a corolla so this was a bit more difficult than I imagined. A very smart friend suggested getting two bases so that the car seat could automatically go in either car. Then getting two rear to forward facing when she’s big enough. diaper bag or tote bag for baby stuff and nursing stuff. You can go as fancy as you want. Simmons Madisson Changing Top plus a Summer Infant Contoured Changing Pad let us convert a desk into the perfect changing table, that will be a desk again in the future. Sealy Waterproof Mattress Cover, White, 52 X 28, 2 Pack Lifesaver now that diapers are leaking more often. mybaby HoMedics SoundSpa On-The-Go We got two one for home and one for school. While it does take batteries it is worth it’s weight in gold. Stork Craft Tuscany Glider and Ottoman, Espresso/Beige I can’t imagine our nursery or the midnight feedings without this rocker. Crane Drop Shape Ultrasonic Cool Mist Humidifier with 2.3 Gallon output per day This keeps A’s nose from drying out and makes using the NoseFrida easier. Samsung SEW-3037W Wireless Video Baby Monitor with Infrared Night Vision and Zoom Of all the monitors we looked at this is the one we went with and it has met all of our needs and more. Highly recommend. Fisher-Price Auto Rock ‘n Play Sleeper – Aqua Stone Fashion A slept exclusively in this for the first five months of her life until she got too long. It is worth the extra money for one that rocks on its own. Promise. Newborn Girls’ Sleep & Play Set – Fun Pink These are what A lived in for the first couple of months. They are easy and if you can find ones (like these!) that zip from the top down, they are worth every penny. Brica Baby In-Sight Mirror, Gray We got two of these, one for each car. Graco SnugRide Click Connect 30/35 LX Infant Car Seat Base, Black While we only needed one bucket seat, we did need two bases. Trust me, get two bases. Infantino Gaga Jittery Elephant we have a couple of these types of toys attached to her carseat and playmat. NoseFrida The Snotsucker Nasal Aspirator You might think this is gross, but I assure you it is totally worth it. Promise. Braun Forehead Thermometer This is now our family’s go to thermometer. Aquaphor Baby Healing Ointment, Diaper Rash and Dry Skin Protectant, 14 Ounce one jar has lasted us almost six months and we use it nightly on A as a massage lotion and when she has the beginnings of a diaper rash. It’s also wonderful on my hands from all the hand washing! Simple Wishes D Lite Hands Free Breastpump Bra, Soft Pink, X-Small to Large trust me when I tell you no other pumping bra compares. Buy at least two. aden + anais Muslin Burpy Bib, Jungle Jam, 2 count and Gerber Organic Birdseye Prefold Cloth Diaper, 5 Count While we love these, truthfully we just use hand towels and washcloths as spit and burp rags. Skip Hop Duo Deluxe Diaper Bag , Deluxe Charcoal This diaper bag is cute enough to be a satchel and has enough pockets that blow outs don’t mix with clean clothes. Infantino Go Ga Ga Deluxe Twist & Fold Gym (Manufacturer’​s Suggested Age: Newborn and Up) We have used this practically every day since A was a month old. She still likes it five months later! Infantino Sash Mei Tai Carrier, Black/Gray I LOVE this carrier. I liked the Moby when A was smaller, but now that she is bigger, I like the ease of use of the Mei Tai. Fisher-Price Spacesaver High Chair, Stripes A loves this high chair. We love this high chair. It fits under our table which is an added bonus! Ingenuity Washable Playard With Dream Centre, Shiloh Because A loved the Rock n Play so much we didn’t use the infant napper on this, but I know lots of mom friends who were in LOVE with it. However, A does love the playard part and I love the adjustable height options. The First Years Ignite Stroller, Pop of Teal (Discontinued by Manufacturer) This stroller is discontinued but it is amazing. There are several that are similar and you will want an umbrella type stroller for when baby is a bit bigger. Baby Einstein Jumper Neighborhood Friends Once A could hold her head up and was able to sit up assisted, we started using this with a pillow under her feet. Now her feet touch the floor and she LOVES playing in it. The First Years Baby Healthcare and Grooming Kit honestly a good pair of adult clippers is easier to maneuver around those tiny nails. Fisher-Price Deluxe Bouncer – My Little Snugapuppy A only loved this for about a month and a half. So we were super lucky to be able to borrow it from a friend. Graco Swing By Me Portable Swing This is another item that A only like for a short time and one that we were so thankful we were able to borrow from a friend. Trend Lab Moses Basket Set, Giggles A actually hated this. We used the Rock n play instead and she was MUCH happier, But each baby is different. 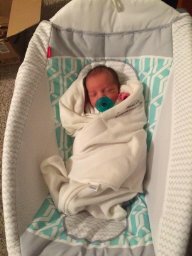 Miracle Blanket Baby Swaddle Blanket, Green with Beige Trim A preferred the Halo Sleep sacks to this one. Summer Infant SwaddleMe Organic Adjustable Infant Wrap, 7-14 Lbs, Small-Medium, Apple and Ivory Again, A hated this wrap.